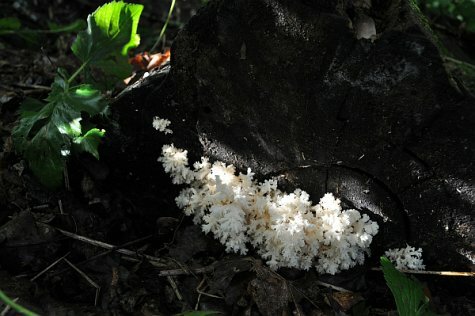 Coming across a coral tooth mushroom (Hericium coralloides) is not an everyday thing. The coral tooth mostly lives hidden from our eyes – the fine fungus threads grow in the trunk of some fallen half-rotten trunk of aspen, birch, black alder or oak. Instead of a cap a bundle of much-divided slender branches grow out from the trunk, looking like a coral from some tropical sea. From the undersides of the branches thin fringes or spines hang. Millions of spores develop at them, and fly with the help of winds to find another decaying tree trunk. The coral tooth has been called the most beautiful fungus in the world. At the end of summer when rains have provided suitable growing conditions for fungi, its beautifully white fruiting body, measuring up to some twenty centimetres across, begins to grow. The Looduskalender team set up a camera at a coral tooth mushroom growing in South Estonia. It will show how a coral tooth grows and who are busy at and around it. The end of the log where the coral tooth grows has a diameter of about 32 cm. See the daily videos at the Vimeo video channel.